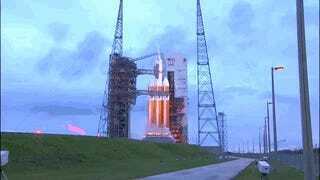 After a one-day delay, Orion blasted off early this morning for its first-ever test flight. Follow the live-stream here along with our updates of photographs, videos, flight details, and tips on when to tune in to catch the most dramatic moments of this historic flight. Thursday's launch attempt for the Orion prototype spacecraft was delayed by gusting winds and scrubbed by a sticky valve. The 4.5 hour test flight is currently on time and underway, with splashdown scheduled for off the west coast of Baja California around 8:26 am PST. Orion is NASA's new prototype vehicle for carrying humans into deep space. While this first test flight is uncrewed, later missions are intended to bring humans to asteroids in lunar orbit, or even on to Mars. For Exploration Flight Test - 1, a Delta IV Heavy rocket manufactured by United Launch Alliance will carry Orion out into space and send it on an elliptical orbit out through the Van Allen radiation belts. The spaceship will ditch everything but the crew module during reentry, splashing down off the west coast of Baja California. The launch window for Exploration Flight Test - 1 starts at 7:05 am EST, extending 2 hours, 39 minutes until 9:44 am. "Our team knows our rocket very, very well. The team was absolutely on their game, listening to everything the rocket was telling us, and it ultimately told us it wasn't ready to go. And so we'll go make sure we've got a happy rocket and as soon as we do that, we're going to get back to the pad and send Orion off to a very, very successful test flight." Here's hoping we have a very happy rocket! Having trouble with the feed? Try an alternate video livefeed, the mobile feed, or an audio-only feed. 12:58 am PST (2:58 am EST): Launch conditions are 40% go for launch, with a chance of rain or strong winds from a storm system moving up from the south of the launch center. The primary concerns as of the current forecast are rain in the rocket launch path (Flight Through Precipitation), cumulus clouds that may extend high enough to be at freezing temperatures (Cumulus Clouds), and wind at the lauch site (Liftoff Wind). The launch team is optimistic that the winds will be coming from a different direction this morning than yesterday, slicing around the thin profile of the rockets instead of smashing head-on into the triple-wide cylinders. After preparing the booster cylinders, the rocket crew started slow-loading cryogenically-chilled liquid hydrogen and oxygen into their tanks. The hydrogen is loaded first, and will be kept at -252°C (-423°F). The liquid oxygen will be loaded later, kept at a warmer-but-still cold -183°C (-297°F). The Orion spacecraft has morning launch windows reserved on Thursday through Saturday of this week, but the storage tanks only hold enough cryogenically cooled fuel to try launching a Heavy on any two of three days. With the Delta IV heavy rocket fuelling started, NASA is committed to the launch attempt. If the launch is scrubbed again today, they will be unable to try during the Saturday window. If that happens, Orion has no more time reserved on the range, and will need to work with the Space Complex for a Sunday launch window. Any later than that, and Orion starts running into logistical conflicts with other pre-scheduled launches. 1:39 am PST (4:39am EST): Oxygen is being loaded into the tanks. 2:05 am PST (5:05 am EST): Weather is currently violating launch condition criteria with both rain and cumulus clouds as a storm rolls in. This was expected, and with a bit of luck will clear up before the launch window opens at 7:05 am EST. 2:23 am PST (5:23 am EST): The rocket is fully fuelled for today's launch attempt. The chilled fuel will evaporate off throughout the launch preparations and countdown, so a small trickle will continuously be added until the terminal countdown. The fill and drain valves used for this trickle-fill refusing to close in the final three minutes of the countdown were what scrubbed the launch attempt on Thursday. 2:36 am PST (5:36 am EST): As this is just the 8th launch ever of a Delta IV in Heavy configuration, it makes sense that ULA would go all-out in photographing this once-in-a-lifetime PR opportunity. But somehow, these rockets seem far more romantic, glamorous, and even soft for typical rocketry photography. This is a romantic rocket gallery. 2:40 am PST (5:40 am EST): Rain has stopped at the pad. Weather conditions are green to go for launch. The forecast remains at 40% for clear conditions once the launch window opens. 2:47 am PST (5:47 am EST): Launch windows are slippery beasts, the result of the careful choreography of orbital dynamics and trajectories. While a window starting at 7:05 am, extending 2 hours and 39 minutes until 9:44 am sounds downright arbitrary, Orion's launch window is determined by the need slip the spacecraft on its predetermined trajectory around the Earth while still splashing down in the Pacific Ocean with ample daylight for recovery operations. Other types of launches have very different requirements: the Orbiting Carbon Observatory had a launch window just 30 seconds long, leading to a scrub/reattempt to get in orbit. Spy satellites are downright notorious for daytime launches. The same dynamics impact how often a launch window can open for repeated attempts: windows for the most fuel-efficient journeys to Mars open up 23 months apart! 3:04 am PST (6:04 am EST): NASA's live coverage has started (streamed above!). Mike Curie, the calm voice talking during most of the live stream. Mike Curie has confirmed that the sticky valves that caused the launch scrub on Thursday were because the fill and drain valves were sitting in extremely cold liquid hydrogen for 2.5 hours and started responding sluggishly. Once the tanks were drained and the valves warmed up, they functioned perfectly and required no hardware replacement. To avoid a repeat problem, Orion just needs to launch earlier in the window. If it does happen again, engineers will boost pressure in the tanks, forcing the valves closed, then cycle the valves repeatedly. This will hopefully loosen them up enough to function properly. NASA Administrator Charles Bolden and show host Brandi Dean, the voice transitioning between NASA live stream coverage segments. USS Anchorage is off shore of Baja California by the splashdown and recovery zone. Weather is currently green in the landing zone, with reasonable waves. An uncrewed drone launched an hour ago, heading for the splashdown zone to hopefully provide footage of Orion splashing down. Your safety checks look good, and you look even better. Please, be happy, and give us a beautiful launch and kick off our weekend in style. I promise to be extremely impressed by your badassery when you casually light yourself on fire with the pooled hydrogen that avoided getting burned off by the licking safety flare to the side of the launch pad. 3:16 am PST (6:16 am EST): Launch managers have reported in that both the Orion spacecraft and the Delta IV rocket look good, with no technical issues being worked at this time. 3:18 am PST (3:18 am EST): Although winds are stronger today, they're coming from northeast instead of north. This is a more favourable direction, as the launch condition criteria can tolerate up to 12 meters per second (23.5 knot) winds from that direction. As the sun comes up and the launch pad warms up, rain is less likely but wind speeds may increase. 3:30am PST (6:30 am EST): The liquid hydrogen and oxygen in the tanks is so cold that it is constantly evaporating. The evaporation is marked by white water vapour at the tops of the tanks, a visible reminder of why the tanks need to be constantly refilled at a tiny trickle during launch preparations. To keep hydrogen from building up on the pad and fuelling a detonation risk, a hydrogen flare stack constantly burns to the side of the launch pad. This red flame adds a bit of drama to the pad while doing a vital job, but it doesn't entirely burn off all the hydrogen. Some of it remains pooled on the pad, but enough remains to set flames licking up the boosters during ignition. While this looks totally terrifying if you don't expect it, it's a normal part of the Delta IV ignition. 3:36 am PST (6:36 am EST): The weather is currently good to launch, and looks better for earlier in the launch window. Winds are currently gusting up to 21 knots, expected to increase to 22 knots at the start of the window and possibly increasing to 23 knots by the end of the window. From this direction, the Delta IV can tolerate winds up to 23.5 knots and still launch. 3:46 am PST (6:46 am EST): The rocket is in a built-in hold at T-4 minutes left in the launch countdown. The countdown will not progress during this 15 minutes. Flight teams will go through checklists, polling that all rocket, spacecraft, range, and pad conditions are good for launch. If all goes well, the hold will end at 7:01 am EST, starting the terminal countdown at T-4 minutes to the start of the launch window at 7:05 am. 3:48 am PST (6:48 am EST): The swing arms need to stay connected to the spacecraft and rocket until the last moment before launch, providing external power to the spacecraft and trickle-fuelling to the rockets. In the last few moments before launch, they swing away. 3:56 am PST (6:56 am EST): Orion is transferred to internal power. All polls are looking good so far; we're about to get to the Go! portion of the morning, hopefully without any Hold-hold-hold! interruptions. 3:59 am PST (6:59 am EST): Dear NASA Livefeed, UStream, Audio feed, and mobile feed: I love you and hate you so bad. If you lag out on me again, I will find something truly horrible for you to do. 4:01 am PST (7:01 am EST): The Delta IV rocket is on internal power. The fill and drain valves are closed. We are in the terminal countdown for launch. Go watch the feed; we'll be back after! 4:04 am PST (7:04 am EST): Range is clear for launch. Who cares if the Delta IV likes to set itself on fire if it gets Orion into orbit safely? L+0:00 (4:05 am PST/7:05 am EST): WE HAVE LIFTOFF! Go, Orion! Go, Delta! Go! Missed the launch? Here's a video of it! L+0:03 (4:08 am PST/7:08 am EST): ULA's Steve Agid is calling the first five minutes of the flight. The rocket now weighs half as much as it did at launch. The rocket is travelling faster than the speed of sound. L+0:06 (4:11 am PST/7:11 am EST): Houston has taken over launch commentary. Second stage ignition was successful. Done protecting the craft from the atmosphere, the service module fairings have jettisoned, reducing weight for the rest of the flight. The launch abort system has jettisoned, with the jettison motor pulling the abort system away from the spacecraft. Jettisoning surplus bits of the Delta IV rocket. Jettison of the service module fairings. L+0:11 (4:16 am PST/7:16 am EST): Everything is going perfect. Just perfect. Every single step is lining up with the plan. Orion is about to reach orbital insertion velocity, and is already sending home streaming video. Good job, not-so-little spacecraft! You're doing incredible! L+0:16 (4:21 am PST/7:21 am EST): The second stage has cut off, but is not jettisoned. Now Orion will coast for 1 hour, 37 minutes until 1:55:26 into the launch, when the second stage will come back online for a 4 minute, 45 second burn. Orion is doing barrel rolls to even out heating, making sure it's evenly baked on all sides. (Technically, this is a "Barbecue roll." Go on, groan.) This maintains even thermal conditioning to help keep any components from overheating. It will continue to roll until the second stage reignites for the next burn at approximately 9:00 am EST. L+0:33 (4:38 am PST/7:38 am EST): The best bit of this long coast period is a chance to catch up adding in launch photos and videos. You know it's true. L+0:44 (4:49 am PST/7:38 am EST): One of three flight test cameras is providing a slightly degraded image. The camera is going to be power-cycled to try to improve the image quality. The camera will be shut down when Orion moves through the Van Allen radiation belts at L+2:05 and again at L+3:30. L+0:57 (5:02 am PST/8:02 am EST): Exploration Flight Test - 1 is specifically designed to incorporate all the riskiest parts of potential missions, not just putting Orion through its paces but putting it through its paces as hard as possible. I've switched to listing times in terms of how far into the test flight we are: L+hour:minute (and sometimes :seconds). So far, these times are lining up beautifully to the planned times outlined in this overview of Exploration Test Flight 1. After the initial rush of excitement, the next major series of events will be at L+1:55, at 9:00 am EST when the second stage engine re-ignites to push Orion out of Low Earth Orbit and out farther than any human-rated spacecraft has gone since the Apollo missions. This will take Orion through the Van Allen radiation belts, testing out its shielding. It will reach maximum distance by L+3:05 before starting the journey back to Earth. If you need to prioritize just one more stint of Orion-watching today, splashdown may be even more exciting than launch, with no chance of a do-over. The spacecraft will shed extra pieces at L+3:23, begin reorientation at L+3:57, and begin reentry at L+4:13 (8:18 am PST/11:18 am EST). We'll briefly lose contact with the spacecraft before parachutes deploy and it splashes down at L+4:24. With a bit of luck, a drone currently loitering in the recovery zone will give of footage of Orion coming home. L+1:25 (5:30 am PST/8:30 am EST): Conditions look good in the recovery area. We won't know exactly where Orion will splashdown (or exactly when) until the second stage engine reignites for the final burn. While a lot is going on in terms of data collection for the test flight, not much is happening that we can follow along at home. Lucky for us, that also means not much is happening for ULA, so they've had time to upload their launch photos! This was an unusual launch for ULA in that Lockheed Martin bought the Delta IV Heavy rocket outright. L+1:47 (5:52 am PST/8:52 am EST): Launch footage downloaded, Orion's flight cameras are back streaming views of the Earth. View from one of Orion's on-board cameras. This entire launch is on battery power, as the service module that would normally deploy solar wings is not yet complete. Instead, the test flight is being done with a size-and-mass appropriate replica for the module. L+2:03 (6:08 am PST/9:08 am EST): The second stage engine reignited right on time, burning for 4 minutes, 40 seconds. Orion is now heading out on its second, higher orbit, travelling farther from space than any human-rated spacecraft has gone since the moon missions. This is where things get extremely interesting for data collection: Will the radiation shielding be enough to protect the craft and its avionics from the Van Allen belts? BIRD, the Battery-operated Independent Radiation Detector will be monitoring the craft from inside to find out! The on-board flight test cameras will shut down as the craft passes through the radiation belts. Everything continues to go absolutely perfectly, so the point where the mission team aren't doing any trouble shooting or even talking much, just sitting quietly watching and gathering data. L+2:54(6:49am PST/9:49am EST): Absolutely no issues are being worked because Orion is a happy, contented spacecraft. All of Orion's thrusters are checked out and working perfectly. Footage from the Ikhana remotely piloted aircraft flying in the recovery zone awaiting documenting Orion's splashdown sure is pretty. L+2:57 (7:02am PST/10:02am EST): The burn information has now been integrated into splashdown predictions, and once again the spacecraft is following the plan precisely. Orion is currently projected to experience a maximum of 8.2g of acceleration during deceleration (that's 8.2 times normal Earth gravity), splashing down within 2.4 kilometers (1.3 nautical miles) of the pre-flight predicted target. By comparison, a Soyuz spacecraft subjects its crews to about 4g during reentry. The Earth as seen by Orion. L+3:07 (7:12 am PST/10:12 am EST): Orion reached peak altitude at L+3:06 of 5,800.4 kilometers (3,604.2 miles). That's within 0.4 kilometers of the pre-flight predictions, continuing the trend of everything being on-time and on-target during this test flight. While higher than any human-rated spacecraft has travelled since Apollo 17, this is still low compared to where our robots go on a regular basis. Geostationary satellites are 6 times higher up than Orion's maximum altitude! L+3:23 (7:28 am PST/10:28 am EST): The Orion crew module has shed the service module. It is now independent for the first time, steering with its thrusters. It will need to reorient in preparation for reentry. NASA just released more launch video, far more up close and personal than a human could stand. This is footage from the umbilical support tower! L+3:55 (8:00 am PST/10:00 am EST): Orion safely transited back through the Van Allen radiation belt back towards Earth. It also fired a quick raise burn to adjust its angle of attack for entry interface with the atmosphere, finessing its trajectory for an on-target splashdown. L+4:13 (8:18 am PST/11:18 am EST): As Orion hit the reentry interface, superheated plasma will briefly cut off contact with the spacecraft. Within two minutes, it will hit a peak temperature of an estimated 2,200°C. Minutes later, protective coverings on the forward bay will jettison to expose parachutes. Atmospheric breaking has slowed Orion from over 32,000 kilometers per hour (20,000 mph) to subsonic speeds. L+04:19 (8:27 am PST/11:27 am EST) The protective coverings on the forward bay jettison, exposing the parachutes. The Forward Bay Cover jettisons through a combination of pyrotechnics, thrusters, and drag from three parachutes attached directly to the cover. The parachutes will slow it down for splashdown in the ocean. Orion descent as seen by an Ikhana remotely piloted aircraft. The parachutes are reefed — opened slowly — to limit both how much force is exerted on them and how quickly they decelerate the crew capsule. L+4:29 (8:29 am PST/11:29 am EST) Orion is safely splashed down! The craft splashed down upright; three of the five airbags inflated to keep it that way. Although this isn't important now, keeping the crew module appropriately oriented will be in the future when the spacecraft carries human crews. A zodiac en route to recover the capsule [left]. Orion bobbing upright in the Pacific Ocean [right]. Orion will be left powered on after splashdown to allow Lockheed Martin to collect more data on its thermal characteristics. The test flight is now over, but recovery operations are just beginning. Orion is in Stable 1: it's bobbling upright in the Pacific Ocean. A variety of craft are converging on it, and are confirming that it's not leaking anything nasty before they start hauling it in close for eventual securing in the USS Anchorage. Once in the well deck, Orion will be transported to San Diego. It appears that the pilot and drogue parachutes were lost, but two of the three main parachutes were recovered. The panels were also lost. This was expected: no data was lost along with the accessories. The recovered parachutes will be analyzed for how they performed during the descent. 9:01 am PST/12:01pm EST: Orion's cooling systems are working perfectly, and the craft is air-tight. The recovery boats are all gathered around the craft, waiting up-wind for the next stage in recovery. In the next few hours, divers will check out the waters around Orion and hook on anchor lines. Lockheed was approved for an extended power test to see how Orion behaves in strange conditions. When the test is done in just over twenty minutes, they will power Orion down. Recovery crews waiting up-wind of the spacecraft. After that, the US Navy will step up recovery procedures to drag the module into the flooded well deck of the USS Anchorage within the next few hours. From there, every bit and bolt of this craft will be examined, analyzed, and pulled apart to determine exactly how it performed beyond "perfectly." This entire mission has been absolutely perfect every step of the way. It's a shame NASA's budget is so small they won't be able to execute the next stage of the test program until 2018! That's it for me; with Orion safely back to Earth I'm taking a much-needed nap! I'll be back later to write a tidier launch report for Orion, hopefully with some better photographs from the splash site. If you see something cool, please be sure to add it to the comments!